Sonos speakers add Spotify Connect and Amazon voice control | What Hi-Fi? You'll now be able to control your Sonos speakers from the Spotify app, giving you full control and all the features of Spotify on Sonos. The Spotify Connect update will go live with a beta software release due out in October. This gives the Spotify app full control of your Sonos system - and even works using your mobile network so you don't have to be connected to your home wi-fi. Sonos says other services, including Pandora, are also looking at enabling a similar level of functionality. Sonos has also announced a partnership with Amazon, specifically the company's Alexa voice assistant. Sonos users will soon be able to control their speakers using any Amazon voice-controlled device, such as an Amazon Echo, Echo Dot or the Fire TV. This is set to launch in beta at the end of the year for a full release in 2017. There is also a new partnership between Sonos and Airbnb, promoting the wireless speakers with Airbnb hosts in an effort to ensure the 'home from home' feel of your Airbnb property extends to the wireless speaker system. Sonos says it wants to be "the sound platform for the connected home", focusing on two main areas: connection (stable connection, access to lots of services) and convenience (how easy it is to play the music you want to play). "Improving the quality of streams" is also a key Sonos initiative for the future. 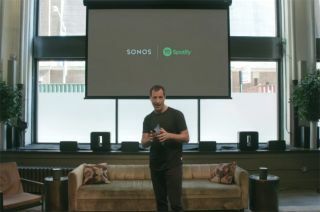 Sonos highlights two new trends that have helped its wireless music business in recent years; the rise of paid streaming - Sonos believes over 1 billion people will be paying to stream music by 2020 - and the growth of connected home products.